Dennis L. Bokelman, 81, of Linn, Kan., died July 9, 2018 at the Washington County Hospital. Visitation: Wednesday, July 11, from 3 to 8 p.m. at Ward Funeral Home in Linn. The family will receive friends from 5 to 7 p.m.
Funeral: 10:00 a.m., Thursday, July 12 at Zion Lutheran Church in Linn. Dennis was born March 30, 1937 to Henry and Clara (Lohmeyer) Bokelman in Linn, Kan. He attended Zion Lutheran School and graduated Linn High School in 1955. Dennis was united in marriage to Marcellene Herrs at Immanuel Lutheran Church, on September 29, 1957. He had joined the U.S. Air Force in 1956, and after marriage, they lived in Waco, Tex., until May 1960. After returning to Linn, he worked for the Washington County Creamery, Linn Locker and twenty-six years as a meat inspector for the Kansa Department of Agriculture. 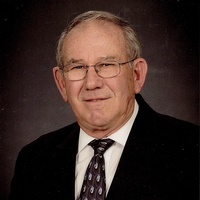 Dennis was a member of the Zion Lutheran Church and served as Head Usher, chairman of the Finance Board and on the Linn Lutheran School Board. He was also on the Linn City Council and Wholmoor Legion Board. He enjoyed gardening and yard work, fishing, taking bus trips and attending the grandchildren and great grandchildren’s sporting events. Preceding him in death were his parents; infant son, James; brother, Jerry Bokelman; sister, LaDonna Rahe; and brother-in-law, Robert Rahe. Survivors include his wife, Marcellene; daughter, Barbara (Ray Dean) Knox, Clifton; son, Brent Bokelman, Linn; three grandchildren, Shandi (Jeremy) Slater, Shanna (Jay) Joy and Dustin (Mistie) Knox; and nine great grandchildren, Madison, Kiara, Maison, Kameron, Mia, Paige, Clay, Hudsyn and Kate; and sister-in-law, Evelyn Bokelman-Ford. Memorial Fund: Linn Lutheran School or Linn American Legion. Contributions may be sent in care of Ward Funeral Home.